When a flood on your commercial or residential property invades, no need to fret, you can count on the water damage Tillamook and mold removal Tillamook pros with 911 Restoration of Portland. Our licensed, bonded and insured water damage Tillamook pros are available to assist and provide affordable solutions 24/7/365. When water or moisture intrude your property, it is important to act fast and implement repairs right away. Don’t let a small and inexpensive leak turn into structural damage and a high repair bill. Call the water damage Tillamook and mold removal Tillamook pros for affordable and long term repair solutions. When a pool of water is left untreated or not thoroughly cleaned, it will cause future problems and pose various repercussions. It takes stagnant water and humidity anywhere between 24-48 hours to produce bacteria and spread mold. Since water and mold are related, both units work together to successfully eliminate hazardous elements on your property. Each affected area is thoroughly inspected and repaired. Prepared to take on any disaster at any given time, our water damage Tillamook and mold removal Tillamook pros arrive at each job site fully geared and equipped. With powerful water extraction machines and strong air movers, you can be back in the comfort of your space in no time. Furthermore, advanced technology such as infrared cameras allows our mold removal Tillamook pros to dig deeper, and inspect wall cavities, under floors and in ceilings. Our goal is to provide long lasting and quality repairs and prepare your property with preventative measures so you don’t have to worry about going through another repair for a long time. If you are looking for a reliable and caring team, contact the water damage Tillamook and mold removal Tillamook pros for your Fresh Start! 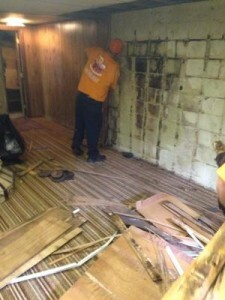 We understand how overwhelming it can be to watch the home or business you built get flooded. Not having any answers makes the situation even more frustrating. No need to fret or worry when you can count on our team. With same day service appointments, a dedicated team and experienced project managers, we work hard to restore your home even better than its original condition. The project manager assigned to you will walk you through the insurance claim process so you can get submit your forms as soon as possible and get it done right the first time.